If you have a pool bigger than a kid’s wading pool that you can easily dump out and refill, you’ll want to have a pool filter. This can be a big decision that you won’t want to rush into. You will need to make some decisions based on your particular situation. Obviously, you won’t want to use a filter meant for an above ground pool on your inground pool and you’ll want to make sure that you size your filter to the size of your pool. Before we look at some of the top rated pool filters on the market, let’s take a few moments to consider what to look for in a filter. 2 What Size Filter Do I Need? The first thing that you will find when you start looking into pool filtering systems is that there are three different types that you will come across. They are the sand type, cartridge, and the diatomaceous earth style. Each will have its own pros and cons. Overall the best way to clean the pool filter is to do a backwash. This will allow you to knock out all of the gunk from your filter media and extend its useful life. It is worth noting that this is not an option for a cartridge type filters. Sand filters can do an outstanding job of filtering your pool water. As the water works through the sand particulate matter is filtered out. This type of filtering can remove objects that are larger than 20 microns. This style of filter is also easy to maintain. Occasionally you will have to backwash the filter and flush out matter that has been filtered out of the water. Then you will need to eventually replace the sand itself, but this will only have to be done about every 5 to 7 years. With standard sand, this type of filter is not the most efficient in terms of energy usage. This is due to the pressure needed to push the water through the sand. There are some sand substitutes that can reduce the pressure and filter smaller particles as well. The cartridge filter system, as the name implies, has a tank outside of the pool into which a cartridge is placed. The water from the pool is then pumped through the cartridge and clean water returns to the pool. This style of the filter can remove particulate matter all the way down to 10 microns, depending on the cartridge that you use. Since the cartridge is designed to have a large surface area for water to move through it can operate at lower pressure and lower speeds. These two make this type of filter very energy efficient. Also, there are no loose media to remove and replace. The cartridge themselves will need to be cleaned, normally a couple times a year, but this could depend on how much you are asking them to filter out of your pool. Eventually, even with frequent cleaning, the cartridge will need to be replaced. They normally last about 3 years, but this can vary based on the particular one that you purchase. Diatomaceous Earth filters are often called DE Filters. This style uses a system of grids covered in the DE material, fossilized exoskeletons, to remove particulate matter all the way down to 5 microns. This makes it the best overall type at a remove of matter from your water, but it also takes more maintenance. When the pressure builds in a DE type filter you will need to remove the old material from the filter and add in new. This can be accomplished either via a bumping handle system or via a backwash system. Both of these remove some of the old material, but for the best results, you’ll want to open the system up and clean out the grid structure by hand. Once reassembled you can add in the new diatomaceous earth and you’ll filter will be ready to run. While these filters produce the best results, they tend to cost more and require more maintenance. Also, various locations will restrict the use of this style filter. Before purchasing make sure you check your local ordinances. When you have determined the style of filter that you want to use, you will next make sure that you size the filter for your pool. Too big of a filter will work fine, but will end up being a waste of money. Too small and it will struggle to keep up with the demands that you put on it. To start we will look at the size of the pump required. To come to this number we will need the size of the pool in gallons. For an example, and to make the math easy, we’ll consider a pool that holds 24,000 gallons of water. Next, you need to determine how quickly you want your filter to go through all the water in your pool. Normally, 8 hours is a good amount of time. If you go to quickly you’ll find yourself trying to buy a monster of a pump. To come up with a number to look at we will divide the number of gallons in the pool by the run time in hours then by 60 minutes in an hour. This will give us a figure in gallons per minute (GPM). With this number, our flow rate, we can now start looking at finding the right sized pump that we will need for our pool. The easiest way to determine this is by finding a conversion chart, like the one below. Pumps are normally sized by the amount of horsepower (HP) that they have. With the size of the pump, you can then begin to ballpark an estimation for how big of a filter you need. For sand, the easy estimation is about 1.0 square foot of filter for every 10,000 gallons in your pool. In our example above with 24,000 gallons, we would be looking at 2.4 sq ft of filter area with a sand filter. However, while you don’t want to go too big, going a touch larger on the filter area wouldn’t hurt, since that will put less strain on the system. Since this is a ballpark estimate you could just round up to 3 sq ft and call it good from there. Or you could just consult another chart for a filter size based on your pump, like the one below. Now there are ways that you can get a lot more precise in determining your size requirements, but that will take a few more inputs and doing some more math, so, for now, let’s leave it as it is. As you are running through the numbers for your pool if you find yourself between sizes, it is a safer bet to move up to the next bigger size. We have broken down our list of the best pool filters into those for inground pools and those for above ground pools. This will let you easily find a solution that works for your particular setup. 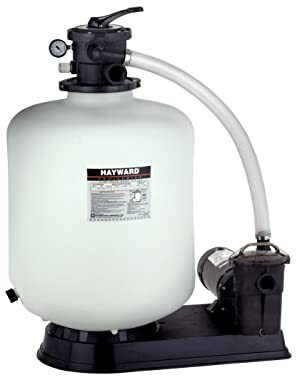 The Hayward S270T Pro Series 27-inch 1-1/2-Inch Vari-Flo Valve Top-Mount Pool Sand Filter for In-ground Pool can be a great choice for your pool. This system uses a diffuser to ensure that the water is spread evenly over the sand inside so that no one area gets more backed up than others. This keeps the filter working smoothly for longer. This filter will require 350 pounds of filter sand. The included base will keep the filter in place and is able to withstand any amount of weather that is thrown at it. 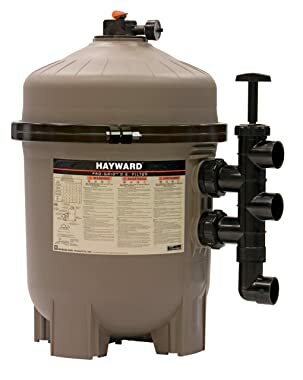 The Hayward S270T Pro Series 27-Inch is a great option for those who are looking for a solid sand filter. If the 27-inch is larger than you require there are also two smaller sizes so you can match your filter to the size of the pool that you have. 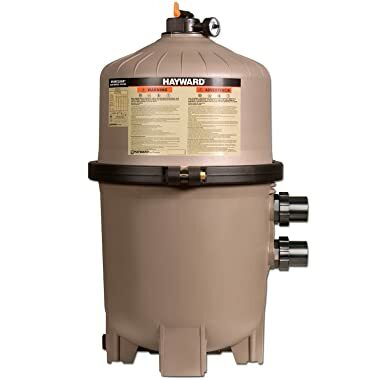 The Hayward DE6020 ProGrid 60 Square-Foot Vertical Grid DE Pool filter is on that will filter out all by the tiniest particulate matter to keep your pool looking crystal clear. The tank is made from highly durable glass reinforced copolymer that should be able to stand up to any conditions that mother nature might dish out while using it. You will need to order both a backwash valve as well as the diatomaceous earth itself to put into the filter. This set up has a pressure value that clearly marks out a red zone. Once the pressure indicator reaches that zone you will need to do a backwash of the system and then may need to add more filtration media. 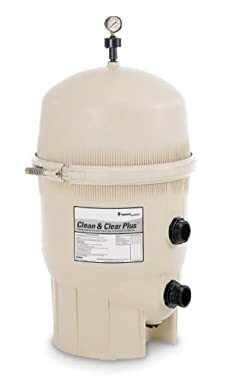 The Pentair 160301 Clean & Clear Plus Fiberglass Reinforced Polypropylene Tank Cartridge Pool Filter is a cartridge based filter that offers a stunning 420 square feet of filtration area. In most situations, these filters should be cleaned every 2 to 3 months and can last between 2 and 3 years. The filter comes with the first cartridge, so once you get it set up you should be ready without having to worry about an additional purchase. The flow rate for this filter is 150 GPM and it sports a drain port at the bottom that can release all the water out of the system when it comes time to either clean the system or close it down for the winter. 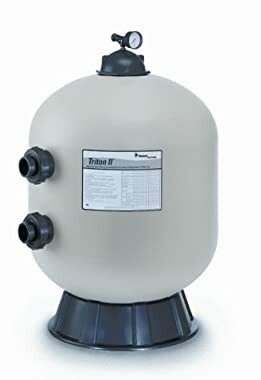 The Pentair Triton II Side Mount Filter TR100 Fiberglass Sand Filter system is a simple to use pool filter that utilizes sand as the filtration media. This system gives you just shy of 5 square feet of filtration area and can handle the flow rate of 98 GPM. The fiberglass material that the tank is made of can last for years and not show any signs of corrosion. It features a diffuser that will spread the water fairly evenly over the sand to avoid certain areas getting backed up. This diffuser can easily swing out of the way for easy access to the sand and internal area of the tank. 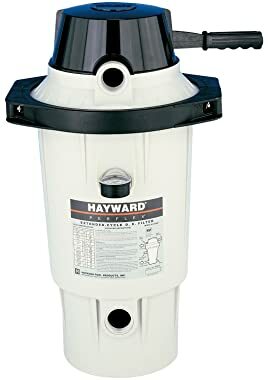 The Hayward C7030 725 Square Feet SwimClear Reusable Cartridge Filter system is another cartridge system, this one giving you a stunning 725 square feet of filtration area. This set up has been designed to deliver longer cleaning cycles that give an extremely high level of water quality but don’t require backwashing. While the 725 square feet model is great for an in-ground pool, there are a number of smaller sizes available if you are in need of a filter for an above ground pool. The system is made of reinforced polyester materials. While it will work find during swimming season if you live in a climate that experiences freeze you might want to drain and store the system over the winter. The Krystal Clear Sand Filter Pump for Above Ground Pools from Intex is a sand style filter that has been sized for above ground pools. 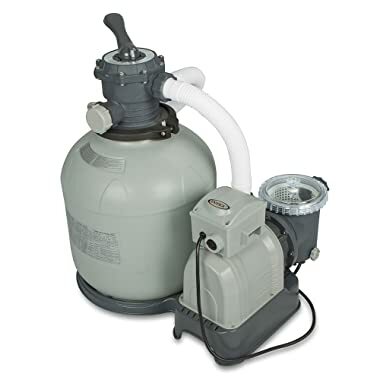 This pump requires a pool of at least 5,500 gallons but can take care of a pool that is up to 19,600 gallons. This translate into an above ground pool that is 16 foot in diameter or larger. This design features a strainer basket that works to keep the sand cleaner so that it will last longer. The company claims that under normal conditions the sand should be a good filter medium for 5 years. The company lists the pump’s flow rate as 3000 GPH but that translates to 50 GPM to give an even comparison to other filters listed here. If you have a smaller pool there are some smaller filter options to save a little money. The EC50AC Perflex Extended-Cycle DE Filter is one that is made to handle either an above ground or in-ground pool. It will keep your pool sparklingly clear using diatomaceous earth. And it only requires 5 pounds of DE each time you flush out the system and refill it. This system is covered by the companies 1-year limited warranty. The setup sports a bump handle to knock the DE off the grids and then allows you to add more. One important note is that this system does not come with a pump, you will have to purchase one separately. The S230T93S Pro Series 23-Inch Top-Mount Sand Filter is a compact filter designed to work with above ground pools. This is another of the popular sand based models. 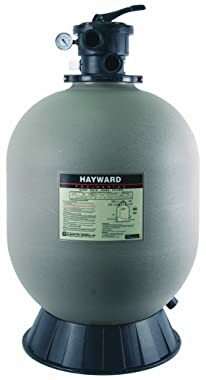 The Pro Series offers a range of sizes with the 23-inch offering from Hayward being the largest of the group. This gives you the chance to move down to a smaller size if required to save some investment. This set up matches the pump and the tank to ensure that your system will work properly once it is assembled and sand is added. At this point, you should have all the information that you need to know to select the best pool filter on the market. You will have to select the type that works best for you and then size it for your pool. Each type has its ups and down, so there is no clear best design that works for every situation. We’ve also given you a selection of outstanding choices for both above grounds and in-ground pool set ups. If there is anything else that you feel we missed or you have some experience with our picks, let us know in the comments section below.